Mt. Pumori is the most popular and beautiful mountain for those who wish to climb over 7000 meter peaks in the Himalayas of Nepal. In this land of mountains, Pumori stands aloof and proud as if aware of its intense effect on the valley below. From the smaller summit belonging to Kala Patter to the sparking slopes of Pumori there appears to be a path that leads to the very sky. Pumori, this incredible pyramid of snow and rocks, is indeed the pride of the Solu Khumbu district. Pumori is generally considered to be technically challenging and requires climbers to be experienced as well as in faultless physical condition. For one such climber this mountain could become the most rewarding challenger in the Himalaya. Our trek kicks off at Lukla. For the actual climb we will use the classical route, which was first opened by a German -Swiss team. We climb the enormous southeast slope till the junction with the northeast ridge. 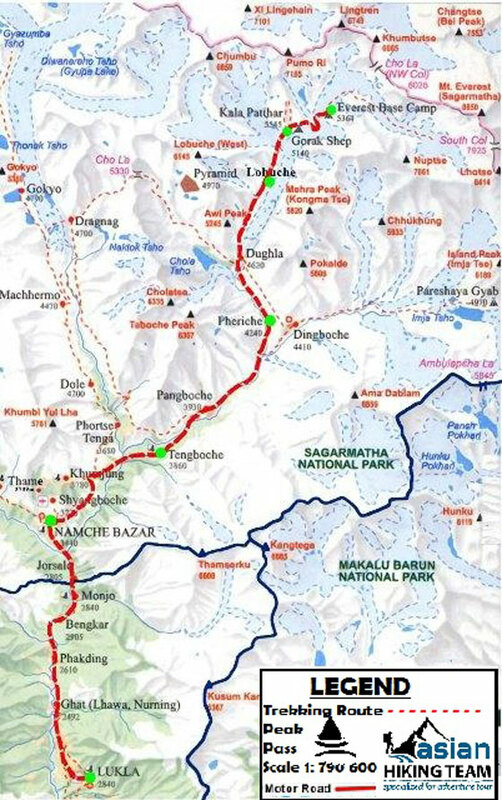 Pumori Expedition route requires the least amount of technically: but is exposed to objective dangers an avalanche prone section and a section exposed to a serious fall. Pumori expedition Base camp will be set up at about 5300m. We climb through the glaciers for approximately 4 hours and reach Camp 1 at 5700m. From Camp 1, we climb 480m. on the face with 40 to 60 degrees slope and pass through a snow wall to reach camp 2 at 6200 meter on a narrow ridge. From camp 2, we climb approximately 450 meters through ice with 30-60 degrees slopes passing through ice walls and crevasses. This section is prone to avalanches from big seracs hanging on the shoulder above. Camp 3 will be set up at an altitude of 6, 480 meters on the ridge. Passing through crevasses, we climb up to Pumori cliff and then to the summit. There are many mountaineers climbing Pumori, check their technical skills and their feelings as well as experience of climbing the Himalayas in Nepal to prepare for 8000 meter peaks in Nepal for the future climbing plan. Day 02: Kathmandu preparetion and free day. Day 04: Kathmandu - Lukla by flight and trek to Phakding. Teahouse Lodge or, Tented Camp. Day 05: Phakding - Namche Bazaar. Teahouse Lodge. Day 06: Namche rest for acclimatization. Teahouse Lodge. Day 07: Namche – Thyangboche. Teahouse Lodge. Day 08: Thyangboche – Pheriche. Teahouse Lodge. Day 09: Pheriche – Lobuche. Teahouse Lodge. Day 10: Lobuche – Pumori Base Camp. Tented Camp. Day 27: Namche – Lukla and transfer to Teahouse Lodge. Day 28: Lukla – Kathmandu by flight and transfer to Hotel. All arrival and departure airport transfers with Asian Hiking Team Assistance. Kathmandu to Lukla / Kathmandu domestic air ticket for members/ cargo fees. Kathmandu to Lukla / Kathmandu domestic air ticket for Liaison Officer. Expedition royalty and climbing permit. Three meals a day (B/L/D with hot drinks) and twin sharing Hotel / Guest house accommodation during trekking and freshly cooked 3 meals, tea or coffee by professional cook in Base Camp. All food and fuel for Base Camp and higher camps during expedition. Baggage/ Equipment allowance for trekking up and down is maximum 50-60kg per person. Base Camp Manager, Base Camp cook, necessary staffs. One high altitude Sherpa per climber to carry all food and gear to higher camps. They will also assist the member during climb and summit attempt. Common climbing equipment (necessary rope, ice bars, ice screws, etc.). All camping equipments like camp furniture (table, chairs), kitchenware, kitchen, dining, guest, shower and toilet tents in Base camp. Base Camp single tent with mattress and pillow for each member, climbing Sherpa, BC staff and Liaison Officer. High altitude tents for all members and climbing Sherpas. Wages, meals, accommodation, equipments, medical and accidental Insurances for Sherpa guide and other staffs. Insurance for climbing Sherpas, cooks, Liaison Officer, and local porters. Solar panel at Base Camp for light and charging small electronics (eg. mobile phones, amateur digital cameras and handheld video cameras). International airfare from / to your country. Hotel accommodation beyond 6 nights (as per itinerary) stay in Kathmandu. Personal climbing gear above Base Camp. Excess personal member’s baggage transport Kathmandu-Lukla-Base Camp US$8 per kg one way. Personal insurance such as travel, accident, medical, emergency evacuation, and lost luggage. Expenses of a personal nature such as hard and soft drinks, laundry, postage, telephone, email, internet etc. Applicable customs duty and import license fees for all personal expedition goods arriving in Nepal by air/road as cargo. Personal solar pack (if any) for charging heavy electronics (laptops, professional camera, batteries, etc. ). Summit bonus / Tips/ Donation. Any other item not mentioned in “THE PACKAGE COST INCLUDES” section.